NEW: Click any of the images to start an interactive slideshow of the process! 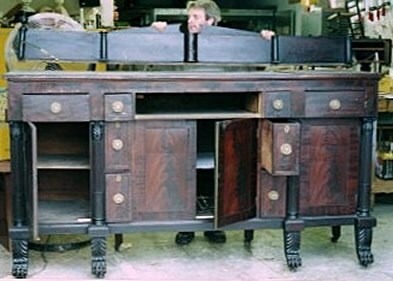 We take antiques from any period, in any state of disrepair, and turn them into beautifully finished, usable pieces of furniture that you can be proud to own. Follow along as we show you how we restored this Empire sideboard (1830) from the old Historic Latimer House in downtown Wilmington, NC. Here, Curtis Martin is disassembling the parts of the sideboard that arrived in his shop nearly black with age and neglect. The parts were chipped, cracked, damaged, marred, or missing. Don't forget to scroll all the way to the bottom to click on the After link and see the great results. You'll be glad you did. What a challenge! 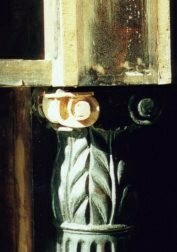 One of the scrolls on this capital was broken off and lost forever. 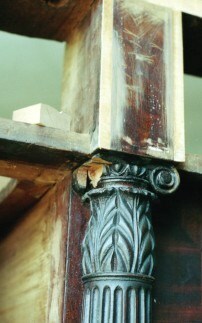 We completely rebuilt the structure and carved a replacement scroll. 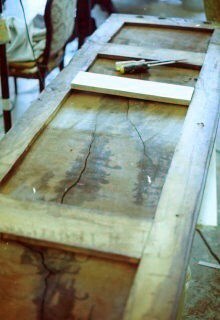 The underside of the sideboard top required some new structural pieces that were made to match the old. Wow, look at those large cracks! They will need lots of careful, skillful attention. 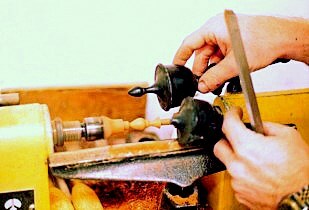 A replacement for a broken finial was created on the lathe to match the other existing ones. 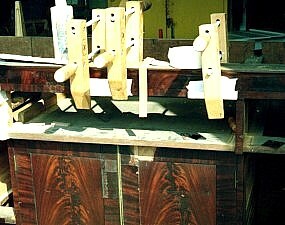 The damage to the delicate, fine wood veneers was patched, repaired, and re-glued with clamps. 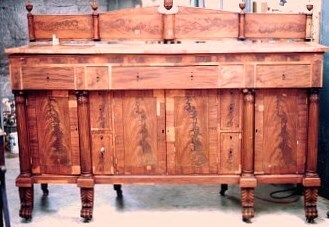 With all the repairs completed, the sideboard is ready for a new finish. 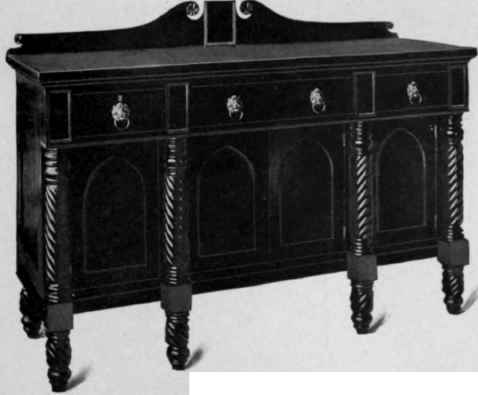 We will artistically restore the finish, ensuring the colors of the new and repaired pieces blend with the older, existing woods. AFTER Click here to see the beautiful results of our restoration efforts.